Butuan is not spared from coffee mania. There are now many coffee shops that cater to every coffeeholics budget and taste. 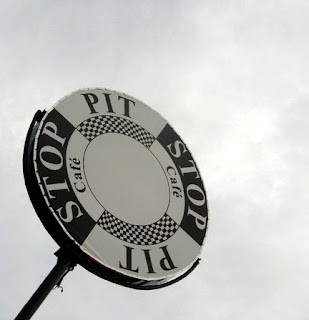 One noteworthy of feauturing here is Butuan’s PIT STOP Cafe along JC Aquino Ave. besides Otis Metro Mall. One look at their facade would give an impression that it is a car repair/hardware store. But once you get inside..it’s really is looking like a car store ~ only that car parts are used as its furnishings or furnitures. Coffee tables made from old tires, foot stools made from empty lube containers, washbins made from old magwheels etc. etc. could certainly make that brewed caffeine go an extra mile over drive. One good point too in this trendsetting cafe is they have a modest space for al fresco diners at the second level where you could sip that warm coffee while enjoying late afternoon sunset views of Mt. Mayapay. I'm reading: Brewed Butuan Coffee PerksTweet this!